Originally posted in June of 2009 I chose this one to bring a smile to your faces this Sunday for our Sunday Favorites re-post. 2.. Pick up the cat and soothe him while you carry him towards the bathroom. Please note this is a joke and not to be taken seriously by anyone. Do not put your cat in the toilet to clean either the cat or the toilet. I love animals and would never harm them. Do not allow your dog to roll on the floor laughing either. 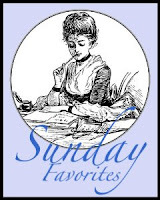 Chari at Happy to Design is hosting Sunday Favorites again today. I hope I brought a little humour into your day. Please go and visit Chari. She is fabulous. Ohhhhh my gosh...I just spit my tea out all over the place, Girlfriend!!! I swear, this is the funniest thing that I have seen or heard in a long time!!! What a hoot!!! I am SO GLAD that you shared this one again with us for the Sunday Favorites party...everyone is just going to die laughing!!! You know...I got a very in depth visual as I was reading this...soooo funny! Ohhh...and if your kitty toilet cleaning wasn't enough...the photo of the dog rolling on the floor laughing...cinched it!!! Kind of looked like me after I read this!!! Hehe! Thanks so much for sharing this with us...I loved it!!! LOLOL - - - those last two pictures are classics! I kinda remember this one - - - I guess I've known you in bloggy land for quite a while now! That's hilarious Lori, wasn't sure where it was going for the first bit. Very, very funny. This is hysterical Lori. 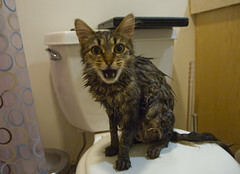 Having seen a cat's reaction when you accidentally get a spot of water on them... The shot of the dog is a hoot too. OMG! Soooooo funny! Found you on Sunday Shwcase and now a follower! That was hilarious - tears streaming down my face reading it. Love the appropriate pictures you put at the end. Too funny! Too funny,Lori....I will think of this for quite sometime and laugh out loud! Thanks for the laugh! One of my favorites, of course Bootsie doesn't agree. LOL Now that gae me a good chuckle for the day! Hmmm, this could be why you no longer have cats as pets, eh? I shall miss my Boots when he dies.....but then again he could out live me...one never knows. He provides much comfort, fun, and work (like emptying his litter box, brushing him to eliminate fur balls, and cleaning up his vomit after he gets done consuming my plants!). Terrible! Terrible ;) You make me laugh! Have a great week! I'm joking, of course, lol! I'm a dog person so you know that I found this hilarious! Definitely one of the funniest things I've read in a long time! Especially since I am NOT a cat lover!! lol If only I had a cat. oh my, this is hilarious...and the disclaimer at the end, PRICELESS! Howling with great glee. This one needed a warning to readers - Do not read while drinking tea or coffee.' ATB!